So the last time I wore cream foundation was years ago! I barely ever wear cream foundation, but once I heard Maybelline dropped the SuperStay Multi Use Foundation Stick, I had to try it because their SuperStay liquid foundation is BOMB! 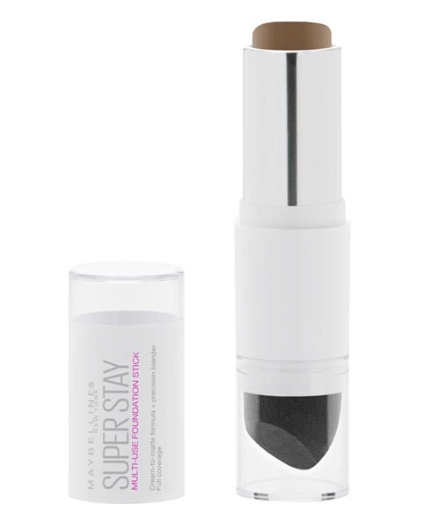 This SuperStay Multi Use Foundation Stick retails for $11.99 and is available in 11 shades! To be honest, I am not a big fan of the shade range because some in between shades are missing. Pero, like? Also, they didn’t consider a large range of undertones. As far as the packaging, Maybelline decided to pack 0.25oz of product in a white tube with an included beauty sponge on the other end. Most foundations are usually 1 fl OZ or more, so the amount of product you get is not a lot y’all! I also think it was pretty silly to pack product in white packaging and add a sponge that you cant thoroughly wash.
Let’s get into the actual quality of the foundation! The finish of this foundation is described as cream-to-matte. Personally, I think that this foundation is in between a matte and dewy finish. It looks like skin, so you see a tad bit of shine. I was so scared to try this because cream foundations can feel heavy on the face. So, what did it feel like? Initially when I applied this foundation it felt heavy, but when I blended it out it felt lightweight. As far as coverage,this foundation is medium coverage. I wouldn’t say it’s buildable, because once you apply another layer and blend it out, it sheers out. I don’t mind medium coverage, but just incase you ladies do I wanted to include that small detail. I decided to purchase this foundation in the shade 360 Mocha, which matched perfectly! I loved the skin like finish, but because I am oily in some areas, I had to make sure to set this foundation with powder so it stays put. Throughout the day you may need to powder once, like usual. My face didn’t appear more oily than other days when I wear liquid foundations. Overall, out of 5, I would give this foundation a 3. I loved the shade match and finish, but Maybelline needs to step up their game when it comes to the amount of product, the shade range and the packaging. Here’s a video of me applying the foundation!